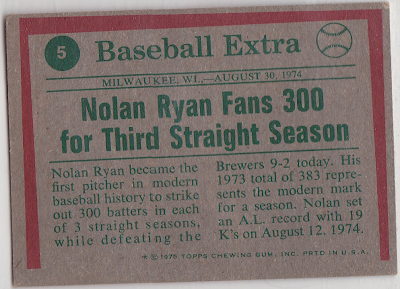 As we now know, the Ryan Express just got started by fanning 300 batters in a season for the third year in a row. He had help, of course, and not just from hitters flailing at 100 MPH fastballs. 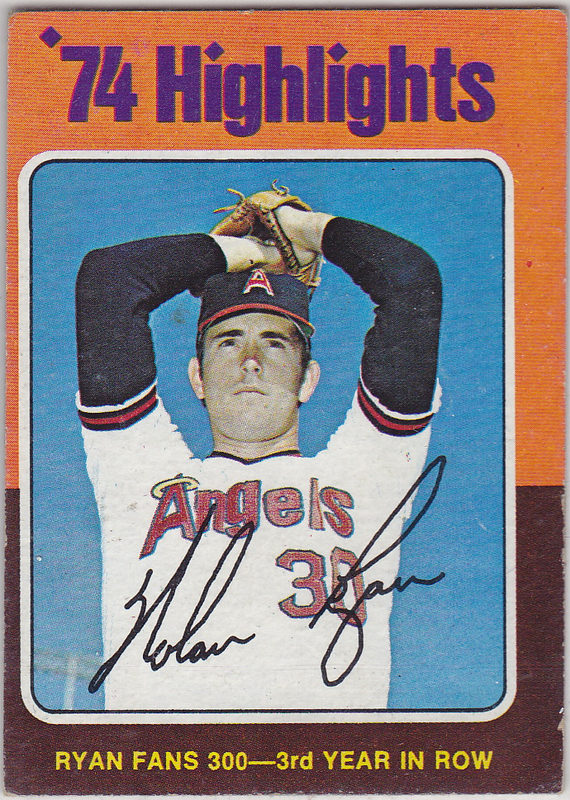 The era's four-man rotation and "finish the game" assumption meant Nolan started 41 games in 1974. These days, that's almost two seasons. He never started that many again, but did break 300 Ks three more times: 1976, 1977, and 1989 (at the age of 42). Ryan critics--and there are some--point out how many guys he walked. Control problems no doubt contributed to his so-so W/L percentage, but he also didn't pitch for great teams, making the post-season in only 5 of 27 years. If there's a connection between the two, it might be that he took good advantage of the free-agent system and considered paydays more significant than playoffs. Since the web can make an image any size, is it hard to tell that this is 1975's "mini" test issue? If memory serves, Topps distributed them only in specific areas of the Midwest. When I started buying cards in the 1980s, minis only showed up in small numbers, but the rise in collecting interest over the last twenty years apparently scared them out of the woodwork. Nolan pitched his last game in September 1993 against my Seattle Mariners. The tour finale ended on a sour note with a first-inning arm ligament tear. His last hit allowed was a grand slam by Dann Howitt, a light-hitting outfielder best known for, well, his grand slam off of Nolan Ryan. As Steve Bartman can attest, there are worse questions to be the trivia answer to! 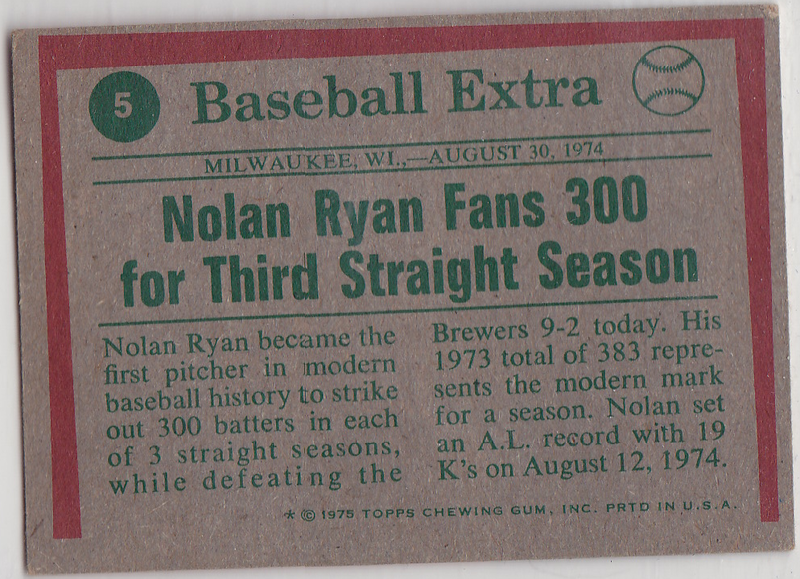 Value: Any Ryan will be a key card in its set, including this highlight. This one runs $5-10 in low grade. Fakes / reprints: Topps reprinted several 1975 star cards as a vintage element in modern sets, so watch for glossier cousins of today's matte-finish cardboard.